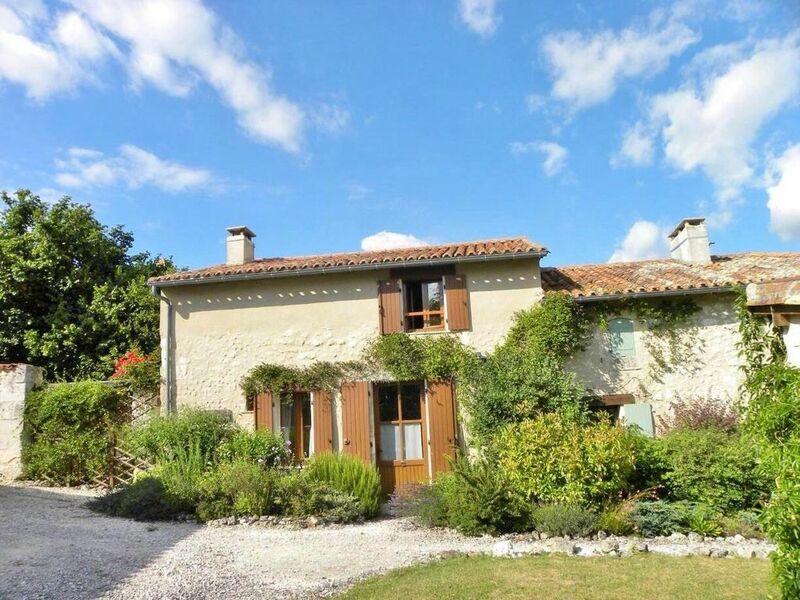 'Les Noisettes' is a lovely 300 year old stone farm cottage full of character , but with modern comforts and Internet connection . The cottage sits in 2.5 acres of landscaped gardens with lovely views, and shares a large swimming pool and tennis court with the six other converted farm buildings .Just a ten minute drive to Riberac and close to beautiful Aubeterre Sur Dronne . Ideal as a peaceful 'home from home' away from the crowds, and a great base for exploring the historic towns of the region. Walking, cycling, sketching, golf and canoeing can all be enjoyed in this area. The ancient village of Vanxains with its boulangerie, post office and small bar/shop for essentials is just 1.5 miles away. The charming market town of Riberac is just 4 miles away. Inside the cottage is light and airy and retains many original features such as exposed stone walls, a stunning Perigordion fireplace with a wood-burning stove and beamed ceilings. The house is superbly well equipped and tastefully furnished. Outside there are two large patio areas - one with views over the swimming pool and the countryside beyond - the other in a private walled courtyard garden to the side of the cottage. The lounge/ dining room has a large sofa and chairs arranged around the wood burning stove , and there is a television and DVD player to enjoy . Susan and Kirk Lloyd fell in love with the Perigord Vert region 6 years ago. We always spent family holidays in France and in 2009 we stayed near the Charente/ Dordogne border. We were absolutely bowled over by the beauty, tranquility and ambiance of the area. As soon as we viewed our cottage at Chez Portier it was a 'coup de foudre! We love the view of the rolling countryside from our patio, where we barbeque produce from the fabulous local markets, washed down with a chilled rose ! It's so relaxing and yet the large pool and tennis court at Chez Portier, not to mention all the activities at Lake Jemaye - keep our hyper active sons happy too! If visiting for a week or less we usually fly into Bergerac which is 1 hour away and hire a car -this is certainly the fastest way to get here. Bordeaux is a little further but a good choice if you fancy a night or two visiting Sarlat or Saint Emilion beforehand . For longer stays , we use the ferry from Dover to Calais or Portsmouth to Le Havre and take our own car. Les Noisettes has everything we need for a perfect holiday. We truly relax here, the countryside is gorgeous, we are surrounded by historic villages, beautiful Aubeterre is just 20 mins drive away, the Friday market at Riberac is really good for meat , fish, cheese, fruit, baskets, jewellery, well everything really! August is a great month to catch all the local 'fetes ' and we have been to some great concerts at nearby villages. As a family , we love Lake Jemaye which is just 10 mins drive away. The Lake has a soft sandy 'beach' and offers free canoeing as well as mini-ski-ing, wonderful walkways and a 'fitness route ' for anyone missing their work outs! Downstairs with shower, washbasin, bidet and W.C. Upstairs with bath/shower over, washbasin and W.C.
New for 2017 ! Les Noisettes now has its own Wifi available to all our guests . Large wooden beamed lounge/diner with original fireplace and wood burning stove, sofa and comfortable chairs. DVD/video player, mini Hi-Fi system, and satellite (UK) TV, plus a small library of books, games and DVD's etc. Dining table with seating for 6. FREE canoeing at LAKE JEMAYE which is 15 mins by car from the cottage ! Lots of opportunities for canoeing on the river Dronne . There is a lovely 9 hole golf course just outside Aubeterre, where equipment may be hired by the day, and it is possible to take part in informal competitions. Clubhouse-style bar on site. There is an 18 hole golf course at Perigeux. More information is included in the cottage's guide to the area. The large swimming pool is shared by the 7 properties at the Domaine. Notes on accommodation: Suitable for families and friends . We regret no pets, and no smoking in the house or around the pool. Outside: Outside there is a large patio area with views towards the swimming pool and the rural landscape beyond. Equipped with a table and chairs and a gas barbecue - it's an ideal spot for relaxed meals with a glass of wine! Les Noisettes also has its own secluded walled garden again with table and chairs - a private spot for that morning coffee! In all there are 2.5 acres of well maintained grounds to enjoy at the 'Domaine', including the large 15 x 7m swimming pool (now gated and fenced in compliance with safety regulations) and a fine all weather tennis court complete with umpire's chair! Utility Room: Ironing board and iron, plus vacuum cleaner are located in the understairs cupboard. Cleaning / Towels / Linen / Maid service: To lighten your load we include all bedlinen and towels (excluding pool towels). Driving to and locating this property from the airport in Bergerac was a little tricky due to the fact that our GPS wasn't working properly. However, we did eventually and it and Wow, what a wonderful find! The Lloyd's cottage, Les Noisettes, was beyond our expectations. We weren't moving into a rental, we were moving into the owner's spotless, well appointed home in the Dordogne. The neighboring cottages are owned and occupied by very hospitable English couples and the grounds and pool are beautifully maintained. Although this property is located in the countryside, it is close to good shopping and restaurants in Riberac and the entire area is dotted with wonderful, historic villages. My wife, daughter and I truly loved the month we spent in Les Noisettes and were truly sorry to leave. This beautiful cottage provided us with everything we needed for a most memorable holiday and we hope to return in the not too distant future. The layout of Les Noisettes was perfect for us. The gite offers stunning views of the rolling countryside, the grounds are beautifully maintained, a beautiful place to relax and unwind.. The pool was a little on the cold side for us but other guests enjoyed taking a dip. Outside dining is a must. If its a little windy the enclosed garden is ideal. The gite is equipped with everything you could possibly need, and its close proximity to Riberac with its lively Friday street market and supermarkets makes it a perfect base to explore the Dordogne. We loved our stay, and the weather in May was perfect. We certainly would like to return. So thank you Susan and Lloyd for letting us use your lovely French home. Thank you for your kind comments ! We were so glad you had good weather - May 2015 was glorious . We hope you will return to Les Noisettes in the future . Lake Jemaye, just 5 miles away has a large sandy beach, children's play grounds, volley ball pitch, cycling/walking tracks and fishing . Canoe hire is FREE during Peak season for 25 mins per session which allows enough time to explore the boundaries of the lake . During the school holidays lifeguards are also present. This is a beautiful lake - lovely for swimming - and safe for children . There are also sandy beaches on the river Dronne at Aubeterre (8 miles) and Saint Auleye (9 miles). Riberac - 4 miles for cafe's, restaurants, banks, and supermarkets. Bike and canoe hire is also available here. Sarlat - 77 miles for restored medieval town. Don’t miss Riberac’s Friday morning market – it is said to be the finest in the Dordogne! We also love the Monday market at nearby Chalais. Les Noisettes is also just 15 mins from Aubeterre-sur-Dronne, one of the 'plus beaux villages de France'. Steeped in history, Aubeterre is so beautiful with its winding cobbled streets and white stone houses with wooden balustrades bedecked with flowers in Summer. Don't miss its amazing subterranean church - said to be the largest in Europe. Guided walking tours of Aubeterre are available in high season and can be booked at the Tourist Information office. Do you love pottering around Antique shops? Well this area has a great selection of 'Antiquaires and Brocanteurs' which we include in our guide. Booking Notes: A deposit of £200 is required to secure your reservation, and the balance must be paid 8 weeks prior to departure. Full payment is required for bookings made less than 8 weeks prior to departure. A refundable security/ damage deposit of £100 is payable with your balance . This will be refunded after the cottage has been checked by our property Manager . Changeover Day: Saturday is our main changeover day . Out of high season we can be more flexible - so please ask ! . Please note that guests are requested to arrive after 16.00 hrs and depart by 10.00 hrs Notes on prices: Prices are for the property per week in GBP and include all bedlinen and bathroom towels , beds made up and cleaning prior to your arrival . Also included are the services of our property Manager where appropriate and French tax. Special Offer for couples : 20 % discount (excluding July and August). Other durations may be available – please contact the owner to discuss.